The chance of survival of a beautiful Nigerian lady suffering from a kidney disease, Tochi Mbonu, now hangs by a thread after she became deaf due to the delay in a kidney transplant operation. 31-year-old Tochi, a graduate of the Benue University, had been on dialysis for the past three years. Her mother, Ndidi, told Punch on the telephone that she and Tochi were stranded in India, where they had hoped to carry out the operation. She explained that a non-governmental organisation, Dignity for the Helpless Foundation, which promised to raise N11m for the operation, disappointed them. She said to make ends meet, she resorted to selling beans cake (moin-moin) in India to raise money for her daughter’s dialysis, until the foundation would have a change of heart. She added that her daughter had gone deaf due to a side effect of the dialysis. She said, “My daughter has been down with kidney failure for the past three years. She spent one year in Nigeria and we have been together in India for two years now. “A friend introduced us to the NGO, headed by Pastor Samuel Brown. He came with his team to interview us in our house. We said we needed money to get Tochi to India for the transplant operation and we both reached an agreement to raise N11m. “He said he would publish it in newspapers and get broadcast stations involved as well. A broadcast media raised the funds with which we travelled. “Before we came here (India), he told me we would open a joint account so that I would know how money was coming in. But he didn’t open any joint account. Instead, he opened a personal account. When I asked him why, he said it was a last minute change by his organisation to reduce conflict over the money. Tochi, who chatted with our correspondent via a social media application, Whatsapp, said her problem started sometime in 2014 when she had a fever and went to a pharmacy to get a drug. She said she never knew that she was given a wrong drug, which affected her body system. “On a particular Friday, my mum sent me to a bank to withdraw some money and there was a queue. I had to wait for my turn. I did not know how I found myself at the security post. When I asked what happened, they said I passed out. “I later gave them a neighbour’s phone number, who came to pick me. When we got home, the neighbour told my mum what happened to me. “I went to the room to relax; I did not know how I got to the hospital where I was unconscious for three days. When I woke up and asked my mum what happened to me, she said I collapsed again. I was told I had no blood and I had already taken three pints of blood. After some treatment, the doctor called my mum and said it seemed I have a kidney failure,” she added. She explained that a test at a military hospital in Yaba, Lagos State, confirmed the doctor’s suspicion and also showed that both kidneys were affected. 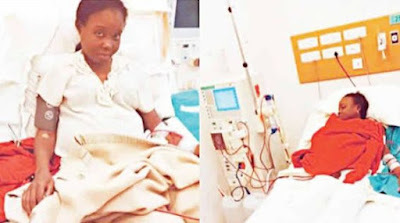 After being on dialysis at Clinix Healthcare, Ilupeju, she said an Indian nurse recommended a kidney transplant, adding that her family was introduced to Brown’s NGO along the line. “We appealed for funds through social media, radio stations, TV stations, my secondary school friends and other well wishers, including the governor of Anambra State in 2015. “We campaigned for N11m. Mr. Brown said he would give me N6m out of the money. For two years now, it’s only N1,440,000 that he has given us. “When I got to India, I had a lot of complications. They realised I was given wrong drugs. My mum has been waiting patiently for over six months that Mr. Brown promised to give us the remaining balance for my transplant. He has failed to give us the money and I don’t know what to do. He is not calling us again,” she said. Tochi, who appealed to Nigerians for help, said she was in a desperate need for the transplant to avert further complications after losing her sense of hearing. When contacted, Brown said he didn’t know the balance in the account, saying he would need to contact his bank for details. When our correspondent asked to know how much he last saw in the account, he said the money was not up to N3m. He said he was not the sole signatory to the account, adding that he needed to call another member of the foundation to go with him to the bank.